And, while others were blanking, he caught steadily from 'the point' area to end up with a shoal of slab-sized bream totalling best part of 70lb. Bailiff Gary Weeks witnessed the weighing of Jamie's catch, taken using feeder some 30 yards out. Furzton – not just for carpies! BUT carp were the only game in town for Matchgroup's Ben Bell in a match on Decoy, winning there (for the second week in a row) with 345lb. And that was after a number of fish being disallowed for going over the limit on some of his SEVEN nets. Meanwhile team-mate Ian Smith was winning on Barford with 111lb of carp – caught just three feet deep close in...after having been advised to fish hard on the deck well out in 14 feet of water. 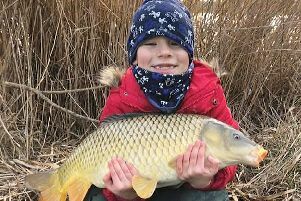 THE river season over, Mark Fisher dug out a 40-year-old float and, armed with advice from the Tackle Hub, headed for Fenny cut and caught a succession of roach, perch and skimmers – a fun-session he described as 'awesome'. DARREN Bruce (Fishing Republic) had a 3lb perch and a 4-12 chub from Newport's Ouse last day of the season. OVER on Sherington pits Mike Winning bagged a 27-8 common, margin fishing. James Scobie had a 19-5 while, in another successful Tear Drops session, Lawrence Wright had a 20-2. ALDERS open: Nick Dean 178lb, Pete Archer 158lb, Bryn Wignall 154lb. MK Vets, canal, Cosgrove Navvi: Kevin Osborne 15-9 (bream to 3-8 plus big perch), Nigel Steel 14-3, Steve Chilton 11-4. TOWCESTER Vets, canal, Heyford: John Balhatchett 9lb, George Mynard 5-9, Tosh Saunders 4-3. TRING Old Codgers (running-line) canal, Bullbeggars: Simon Pavey 8-1, Martin Rodwell 6-8, Brian Elliott 5-4-8. NENE/Towcester, Wappenham Water: John Balhatchett 7-12, Brian Beard 6-10, Dave Gibbins 4-4. MK golden peg, canal, Willowbridge: Ernie Sattler 7-4, Kevin Osborne 5-11, Colin Chart 5-2. FIXTURES: Wednesday, MKAA AGM, 8.30pm MK Irish Club, Manor Fields; entries open for MK canal spring league teams-of-four, 01234 713144.